(CNN) -- "Puzzle Quest 2" mixes elements of the classic color-matching game such as "Bejeweled" with role-playing, fantasy gaming. In the beginning, the game seems like a typical RPG adventure. Players select from one of four personas -- Sorcerer, Templar, Barbarian or Assassin. The character is outfitted with basic weapons and armor and sent to a small village to begin the quest. In-game combat isn't the typical hacking and slashing of monsters. Turns are played out on a field dotted with colorful gems, skulls and action-point icons. The objective is to match three or more of the items to accumulate spell strength, abilities or to damage your foe. The action is similar to "Bejeweled" -- the quick, but addictive time-killer that should be familiar to many Facebook users -- in which points are awarded for matching gems. "Puzzle Quest 2" also etches a symbol on each colored gem so those affected by colorblindness (like myself) can play. There's also a pointer that will indicate where a possible match can be achieved -- although it may not be the best possible move for the player so strategy and planning are still needed. The story mode gives adventurers the chance to save a small village from the clutches of an evil demon. 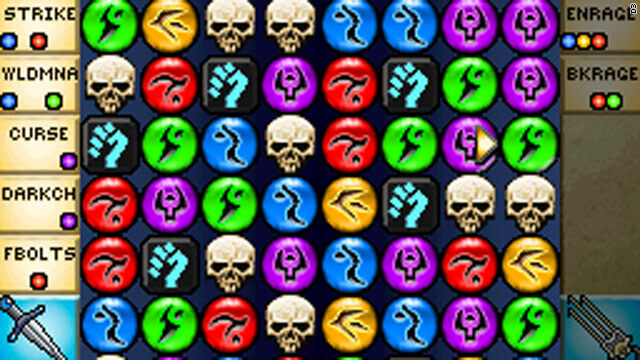 Weapons, spells and abilities are all activated by matching up and storing energy from the gems. Characters also can level up to gain more spells and abilities just like a typical RPG game. But lots of actions you perform in the game's role-playing sections are controlled by solving different puzzle games. Trying to pick a lock? Solve a puzzle. Figuring out how much loot is available? Solve a puzzle. Hoping to avoid a trap? Solve a puzzle. Routine interaction between the player's character and villagers or friendly monsters, thankfully, isn't a puzzle, but is brief and to the point. The graphics are pretty straightforward, but the artwork is masterfully crafted. The music is sublime without becoming intrusive or repetitive. The game is available for the Nintendo DS handheld console and will be available on the Xbox Live Arcade on June 30. Online and multiplayer action also is available to handle bigger challenges with friends. It isn't a massive, time-consuming "World of Warcraft"-style game by any stretch of the imagination. But it is a step toward removing the "casual" label from games in the gem-matching genre. "Puzzle Quest 2" neatly straddles the line between the two genres without feeling too much like either one.